A big thank you to everyone who recently contacted us with kind words of support both online and in person, in response to our first blog. It has been hugely encouraging to us and so lovely to hear of your delight at the prospect of The Bell reopening. The realisation of the immense task we have taken on is a daunting yet exhilarating prospect. We both love a challenge and The Bell presents an abundance of them – not least of these is time. Apologies again to all you keen customers eager for us to open by December…. Perhaps a Christmas drinks party might be in order? Over the past month we have been extremely busy getting ‘stuck in’ to clearing the site with terrific assistance from Duncan, Lindsay and their boys. As you can see from the pictures below Marcus has been toiling hard, (what Amelia has been up to is anyone’s guess…. taking photo’s?!) It’s been an industrious site with a wealth of heavy lifting and lots of sweat and smiles. 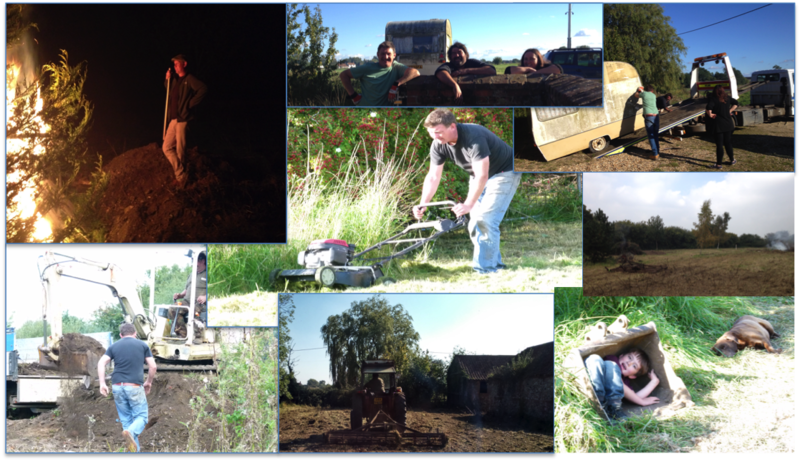 The results thus far: – a beautifully cleared site, some nice big bonfires, loads of lovely photos and one very sore finger!